Do you love all things health? Do you feel a drive to inspire others with your health story? 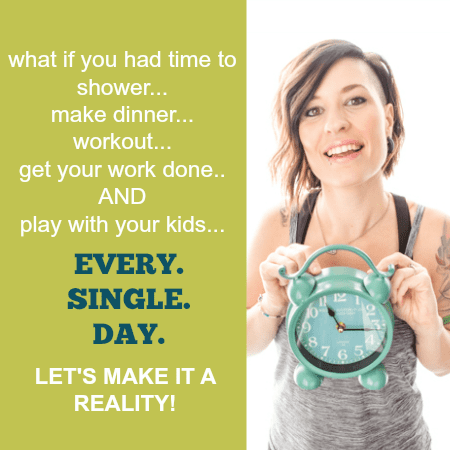 Do you read other health blogs and think, “Hey, that’s something I’d like to do? !” You are in the right place! Because let me tell you. Now is the time to start. Today is the day that you are going to begin sharing your story, your passion, and your experiences with the world. You may be thinking that you don’t have the time for this. Maybe that’s what has been holding you back for so long. Maybe you think it’s complicated and time-consuming and that you haven’t the slightest idea where to even begin. Luckily, you are in the right place at the right time because I am about to make your life a billion times easier and show you every single step you need in order to start a health blog in about 15 minutes. Seriously, give yourself 15 minutes, follow-along with the illustrated steps, and before you know it you’ll be ready to type out your first blog post. 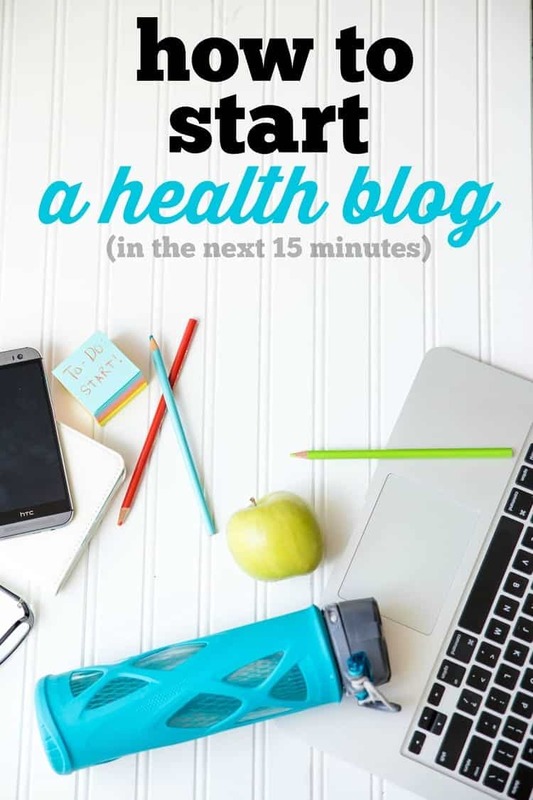 There are two steps at the very beginning of starting a health blog that get people stuck right off the bat. It often leads to frustration and possibly even throwing in the towel all together before even getting off the ground. Those two steps are choosing between WordPress.com vs. WordPress.org and choosing a domain name (ie, the name of your blog… the part between the www. and the .com). I’m going to help you out with those two steps right away before you start to get frustrated at all. 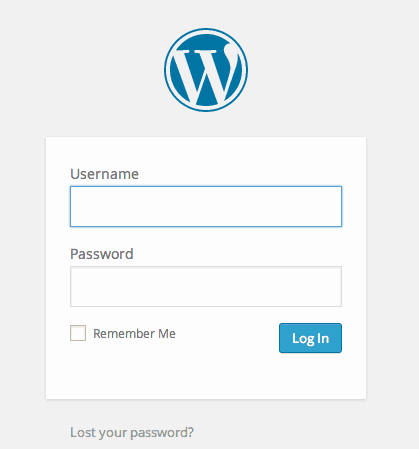 First off, I recommend starting with a self-hosted site using WordPress.org. Why? This type of a site will give you the most freedom and the most control over your blog. (ahem, more freedom & control = more potential earnings.) There is a small cost involved, but it will be worth it in the long run to have total control over your own site. So the first thing you’ll need to do to set up your self-hosted blog on WordPress.org is select your domain name and hosting package. There’s that domain thing… don’t get nervous, I’m gonna help you. You’ll want to do a little research on this before you choose a name for your blog. You want something that fits you and your message. You’ll want something that’s not used already. And you’ll want to make sure you can get the .com. Not the .me, .biz, .tech, .xyz or whatever other random option there is out there. You can buy as many of those as you want, just be sure that you definitely get the .com. Brainstorm as many names as you possibly can. Once you’ve sat on it for a minute or just decide to impulsively go for it because it’s just that freakin’ awesome, you’ll want to head on over to Bluehost to see if it’s available, and then snag it right up before someone else does! 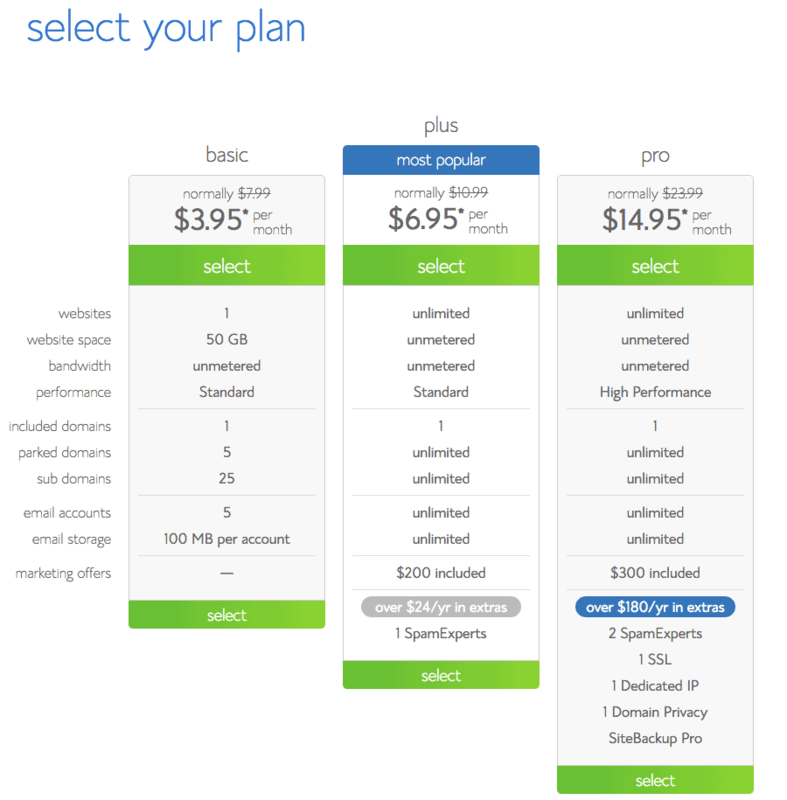 Once you have your domain, you may be asked to pick your plan level. I definitely suggest the Basic Plan, which is paid in one lump sum instead of monthly, but it will save you quite a bit in the long run. Along with purchasing your domain name, you need to host it. Hosting is like renting space on the internet in order to actually display your blog. 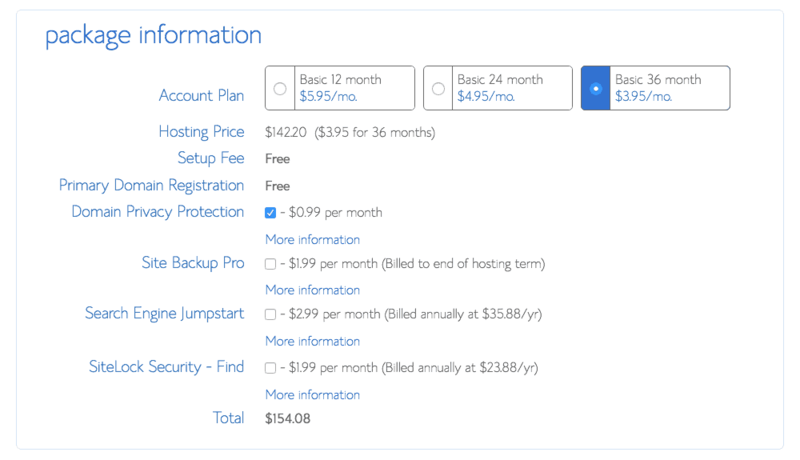 Bluehost has great rates and gives you your domain name for free if you decide to host with them. That’s kind of a no-brainer if you ask me, especially if you are just starting out. Below is the package settings I’d use when signing up. The Domain Whois Privacy shields your personal address and phone number from being displayed to the public. Once you’ve completed registration with Bluehost, you’ll need to go through the process of installing WordPress. WordPress is the blogging software you will use as the foundation of your site.This was another step that I totally thought would be complicated when I started blogging, but Bluehost truly makes it easy. Login to Bluehost and find the Website Builders section. Click on the WordPress logo. On the next page, click the “Install” button in the “Do it yourself FREE” section. Once you get the message that says “Your install is complete!” you’ll want to click on the “View Credentials” button and write down your Admin URL, Username, and Password. You can change these to something more memorable later, but you’ll need them for the first time logging in. You’ve officially logged into your blog and can get started by hitting New Post and start typing! Once you’ve set up your new health blog, let me know your URL down in a comment below so I can come check it out! I can’t wait!